SEATTLE, Mar 4, 2011 / — Tommy Bahama, the popular lifestyle brand, marks the second year of their agreement with Major League Baseball Properties with the release of their new “Collector’s Edition” series for the 2011 MLB season. These custom designed shirts continue the relationship between Tommy Bahama and Major League Baseball Properties to establish a co-branded collection of premium, collectible apparel for the true baseball fan. 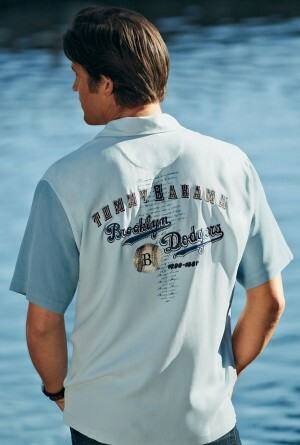 To launch the 2011 season, Tommy Bahama is releasing eight new “Collector’s Edition” MLB team shirts including the 2010 World Series Champion San Francisco Giants, Chicago White Sox, Houston Astros, Minnesota Twins, New York Mets, San Diego Padres, and the Tampa Bay Rays, as well as a Brooklyn Dodgers throwback shirt. These unique shirts are individually designed for each team with customized graphics, team logos, landmarks and a genuine vintage style. Only a limited number of each team shirt will be produced, numbered and accompanied by a Tommy Bahama Collector’s Certificate. The Brooklyn Dodgers throwback shirt, featuring classic artwork reminiscent of the team’s many years in New York, will be the first one to be released on March 3rd. The remaining team shirts will begin to roll out on Opening Day of the 2011 MLB season, starting with the Rays on March 31st, followed by the Giants on April 7th, the White Sox on April 14th, the Astros on April 21st, the Padres on April 28th, the Mets on May 5th, and the Twins on May 12th. Also available are the limited edition Tommy Bahama 2011 Spring Training shirts for the Cactus League and Grapefruit Leagues. The eight MLB team shirts and the Spring Training shirts will be sold exclusively at http://www.tommybahama.com/TBG/Men/MLB_Shop.jsp and select Tommy Bahama retail locations.